The NHL’s Top 100 Players Of All-Time list hasn’t even been released yet, and it’s already incredibly flawed. When the full list is released today, January 27th, it will not include Evgeni Malkin. To the casual fan that watches their team play occasionally and peruses the NHL Network highlights, this might not seem like a big deal. As someone who has watched nearly every shift that Malkin has taken in his career, I would have a hard time finding more than a handful of players ever that have the talent and ability to take over a game single-handedly like the Russian superstar. Up to the 2017 NHL All-Star break, Evgeni Malkin is 30 years old and has played 691 NHL games in 11 NHL seasons. He has scored 317 goals and 497 assists, which is good for 814 points. Malkin’s 814 points place him 151st in all-time NHL scoring. Consider that Malkin still has several elite seasons left in him, and you can see it is quickly apparent how egregious of a negation he is to the NHL’s Top 100 players of all-time. The crazy thing is, my argument only gets stronger from here. Geno’s 814 points in 691 games is good for 1.178 points per game. That is good for…wait for it…14th all-time in NHL history. Yeah, the guy who was not deemed a top 100 player of all-time only has 13 players who scored at a faster rate than him. Considering that Malkin plays in the hardest era to score that we have ever seen in the NHL, this only makes it that much more impressive as many of those 13 players in front of him played in eras where goalies didn’t even play the butterfly position for crying out loud. Malkin is undoubtedly one of the greatest regular season scorers that we have ever seen, but he gets even better as the stakes get higher. In 124 NHL playoff games, Geno has scored 48 goals and 81 assist for 129 points. Where does this rank among everyone in NHL history? Well inside the top 100 at 44th all-time. And yep, you guessed it, Malkin’s playoff points per game is even more impressive. His 1.040 playoff points per game slots him in at 22nd all-time. If it is not apparent already, Evgeni Malkin is not outside of the top 100 all-time at anything he does and his career isn’t even close to finished yet. Another thing that makes Malkin’s accomplishments that much more impressive is that he’s done all of this while playing second fiddle to Sidney Crosby. Malkin is an elite first line center and the franchise player for just about any other team besides the Penguins. Most players of Malkin’s caliber would not stick around when it’s apparent that they’ll never get the attention they’d get elsewhere. Geno doesn’t just “stick it out” in Pittsburgh though, it’s truly where he wants to be. He is a team player first and he’s made that evident throughout the years. 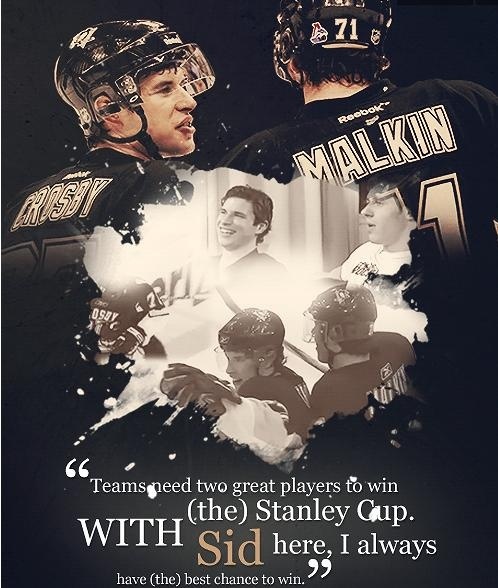 The relationship between Malkin and Crosby is one of the NHL’s most underrated bromances. Malkin’s importance as a player goes far beyond his stats, as he’s matured into one of the most vocal leaders in the Penguins locker room. Malkin not only talks the talk, but he backs it up on the ice every single time. Last season, when the Mike Johnston coached Penguins were struggling and it looked like they would not make the postseason, Malkin took to a post game interview to declare, “We will make playoffs.” Along with Marc Andre Fleury, Malkin carried the Penguins to keep them competitive until Mike Sullivan took over and revitalized the team. This season, after the Penguins lost their third straight game to the Detroit Red Wings 6-3, Malkin proclaimed, “These next three games, we should win.” The Penguins did just that and Malkin scored a hat trick in his very next game. He scored 6 points in those three wins and was by far the Penguins best player in that stretch. So when you see lesser players listed on the NHL’s Top 100 players because of their leadership, keep this paragraph in mind. Evgeni Malkin is quietly one of the best leaders in hockey. First player since 1917–18 to score goals in each of his first six NHL games. Longest point streak by a Russian player in the NHL, 15 games. Most consecutive post season games with multiple points for the Pittsburgh Penguins, 6 games. First Russian player to win the Conn Smythe Trophy, 2009. 2nd fastest Russian to score 500 NHL points, 413 games. Behind only Alexander Ovechkin, 373 games. 1 of 9 Pittsburgh Penguins players and 1 of 6 Russian-born players to record 50 goals in a regular season. Second player, first Russian player, ever to lead both the NHL, and the IIHF World Championships in scoring in the same season, 2011–12. The only knock that anyone can have against Malkin at this point in his career is that he has missed quite a few games due to injury and that’s hardly his fault. The few active players that should rightfully be ranked higher than Evgeni Malkin are Sidney Crosby and arguably Alex Ovechkin (Jagr should be a no brainer). That’s it, that’s the list. When he’s on the ice, Evgeni Malkin is one of the best ever and he’s well inside the top 100. A Pittsburgh icon, a Russian celebrity and an NHL legend. Evgeni Malkin deserves more respect for what he’s done, and he sure as hell deserved to make that list.